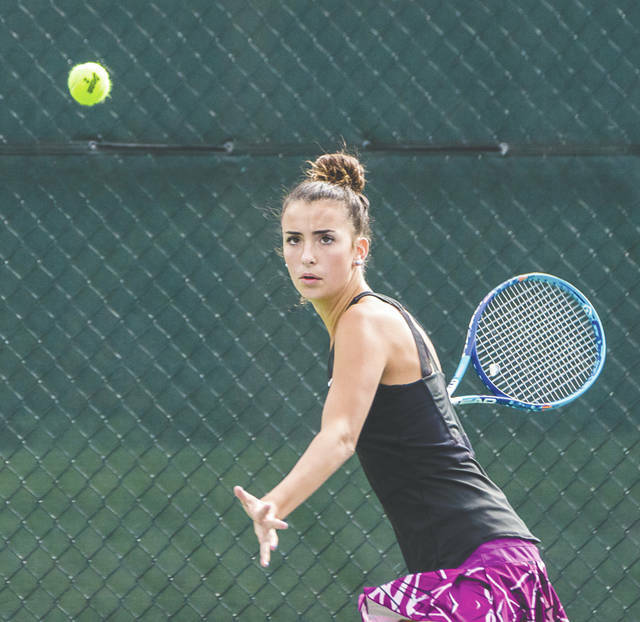 CENTERVILLE — The annual girls high school tennis battle between neighbors Beavercreek and Bellbrook has been a close match through the years, and the Sept. 6 team contest on the Five Seasons Sports Club’s outdoor courts was no exception. Host Bellbrook (9-3) won the three singles matches, and Beavercreek (8-4) took both doubles contests, to give the Golden Eagles a 3-2 win. It’s the fourth time in the last five years that the annual match has been decided by a 3-2 score. 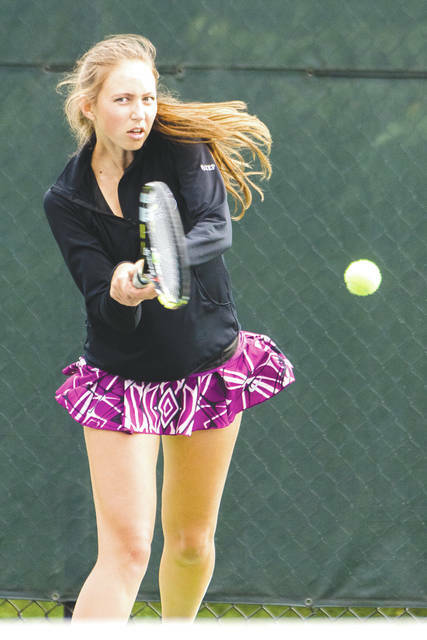 At first singles, Bellbrook junior righthander Andrea Szep used solid baseline strokes and a heavy serve to defeat ‘Creek sophomore lefty Julia Bays by a 6-3, 6-1 score. 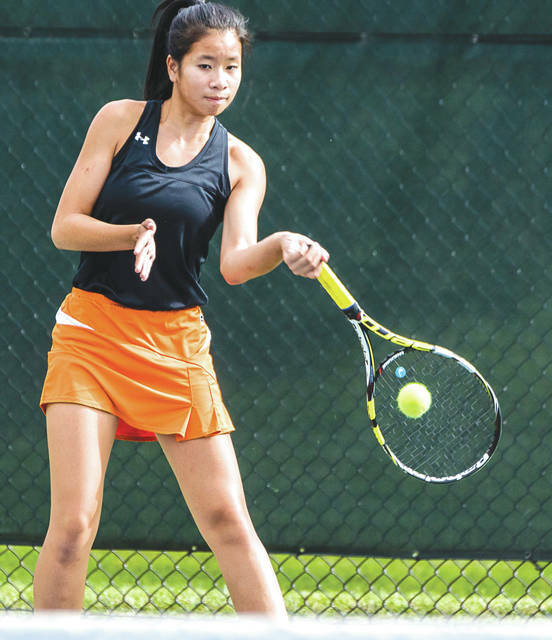 But soon after, the Beavercreek first doubles pair of seniors Vania Jiao and Esther Hu won in straight sets over Bellbrook’s Abby Schultz-Paige Buttery tandem, 6-2, 7-6 (3) to even the team score up at one match apiece. Golden Eagles senior Shea Foster then turned in a 7-5, 6-1 win over Beavercreek junior Dhira Venkatramani to put Bellbrook out in front 2-1 in the team score. Bellbrook’s No. 3 singles player, sophomore Anika Arora, then clinched the match with a 7-5, 6-1 win over Beavers senior Melinda Dacri-Kim. In the final match of the afternoon, Beavercreek’s senior duo of Remy Stanforth and Anna VanDeWiele claimed a 7-5, 6-0 win over Bellbrook seniors Jessica Schantz and Hailie Leftwich. “It’s always a tough match between us, so I feel pretty good about getting this win,” Golden Eagles coach Dean Grisso said. Bellbrook deliberately plays a tough non-league schedule in order to prepare the team for the postseason. The Golden Eagles have faced perennial Division I tennis powers Springboro, Centerville (twice) and Cincinnati Sycamore in recent days. “We play the Springboros, Centervilles, Beavercreek, Sycamore and Lakotas in order to prepare us for our league tournament, sectionals and districts. We schedule these tougher matches just so it’ll help us down the road,” Grisso said. Beavers coach Bill Stanforth knew his team would be in for another annual battle with their Bellbrook friends. “We’ve been strong at doubles. And our singles players played great matches tonight, but Bellbrook’s got a good team. It was going to be 3-2 somehow, either way, but they ended up on top,” Stanforth said with a smile. Beavercreek’s next match is at 4:30 p.m. Thursday, Sept. 7 at Springfield High, while Bellbrook returns back to Five Seasons to host Miami Valley for a 4 p.m. match on Thursday. The Golden Eagles will get three days to rest after the Miami Valley match, then they’re scheduled to play five matches in five days next week. Bellbrook’s No. 1 singles player Andrea Szep returns a baseline forehand shot to Beavercreek’s Julia Bays, during Wednesday’s Sept. 6 girls high school tennis action at the Five Seasons Sports Club. Szep won the match, 6-3, 6-1. Bellbrook’s Shea Foster eyes a forehand shot during No. 2 singles play on Wednesday Sept. 6 at the Five Seasons Sports Club in Centerville. Foster claimed a 7-5, 6-1 win over Beavercreek’s Dhira Venkatramani. Beavercreek sophomore Julia Bays smacks a forehand from the baseline in No. 1 singles action, Sept. 6 at the Five Seasons Sports Club in Centerville. Beavercreek No. 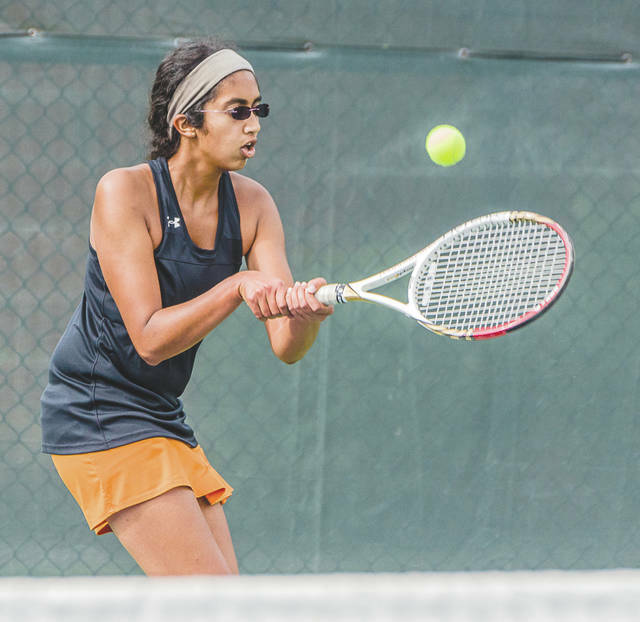 2 singles player Dhira Venkatramani focuses on a backhand return during Wednesday’s girls high school team tennis match with Bellbrook at the Five Seasons Sports Club in Centerville.